Consumers shopping at Wal-mart and Sam’s Club stores in Southern Nevada will have a new way to pay beginning next year as the retailer continues to expand its payment options. 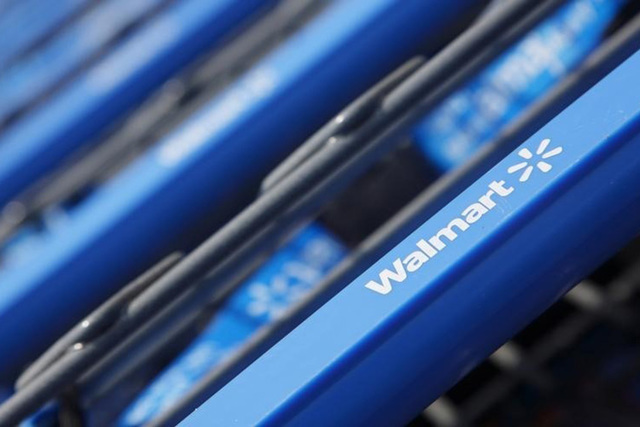 John Gress/Files/Reuters Wal-mart Stores Inc. will offer J.P. Morgan Chase & Co.’s Chase Pay, a closed-loop network as a way for shoppers to pay for things on Walmart.com and in the Wal-mart app, including the Wal-mart Pay mobile service in stores. Wal-mart Stores Inc. will offer J.P. Morgan Chase & Co.’s Chase Pay, a closed-loop network, as a way for shoppers to pay for things on Walmart.com and in the Wal-mart app, including the Wal-mart Pay mobile service in stores. The company also lets shoppers use PayPal on the Wal-mart website. According to eMarketer, U.S. mobile payments this year will reach $27.05 billion, with users spending an average of $721.47 annually. In 2015, mobile payments totaled about $8.71 billion in the U.S., with users spending an average of $376 annually, the data firm said. Chase Pay is the first third-party digital wallet on Wal-mart’s website and app, according to both companies. Customers can pay within the app with any major credit card, debit, pre-paid or Wal-mart gift card. Apple Inc.’s Apple Pay and Alphabet Inc.’s Android Pay are the most popular digital wallets, and U.S. retailers have launched many mobile payment apps in the past few years, with Starbuck’s app being the most well-known to consumers. Starbucks launched its mobile card app in 2009, allowing customers to pay by displaying a barcode, or simple QR code, to be scanned at the point of sale. A QR code, abbreviated from Quick Response Code, is a machine-readable optical label that contains information about the item to which it is attached. Starbucks also features a mobile order-and-pay platform, which allows users to order and pay in advance and then pick it up at selected Las Vegas locations. Wal-mart Pay was launched in 2015 and works by using the device’s camera to scan a barcode or QR code and a four-digit pin. An electronic receipt is then sent to the app. One of the downsides to using QR codes is they require users to unlock their phones and open an app to pay for their purchases. Apple Pay and other payment services use NFC, or near field communications, which allows users to simply touch their phone at the point of sale to complete a transaction. “We’re delighted to strengthen our ties with Wal-mart to deliver a seamless payment experience to our mutual customers,” said Jennifer Robert, president of strategic alliances and loyalty solutions for Chase. It’s not known how many people in Southern Nevada use Wal-mart Pay. Wal-mart says more than 22 million customers actively use its mobile app every month. According to Wal-mart, there are 19 Wal-mart stores, Wal-mart Supercenters, and Wal-mart Neighborhood Markets in Clark County. Wal-mart officials did not respond to an interview request. In addition to Chase, Wal-mart customers still will be able to pay with credit cards as they normally would. The retailer also accepts MasterCard Inc.’s Masterpass and Visa Inc.’s Visa Checkout. Wal-mart also offers its own prepaid cards with MasterCard and Visa. “Also, more merchants will adopt point-of-sale systems that can accept mobile payments and incentives like promotions and loyalty programs will be integrated to attract new users,” he said. Yeager said the change is being driven by younger consumers who generally have fewer apprehensions when it comes to experimenting with and eventually adopting new technologies. “Ultimately, mobile wallets will need to have a strong track record of security to attract more users across all demographics long-term,” he said. But how do mobile payments work? Essentially, mobile payments are initiated through a smartphone app, which consumers can set up with their preferred payment method. Money used to facilitate these mobile payments is stored in digital wallets, which may be provided by a bank, private non-bank company or other financial institution. For example, a Southern Nevada consumer may link his digital wallet to a bank account, debit card or credit card. Older consumers have been slow to adopt the new technology over concerns about the security of mobile payments and digital wallets. Acceptance at Las Vegas retailers also has been slow because most systems require new equipment. But analysts say the concerns are misplaced because the transactions are encrypted. Depending on the app and hardware used, that data also might be tokenized. Tokenization means that credit card numbers are translated into a token ID number that’s used only for one transaction. Even if a hacker obtains the token, it won’t enable them to access or use the card for additional transactions. Chase officials say Chase Pay uses token technology to protect consumer data. While Chase has been aggressive in rolling out its mobile technology, other banks in Southern Nevada have introduced mobile payment apps, including U.S. Bank, Bank of America, Wells Fargo and Citibank.